Buy online Haisa Marble Light 12 in. x 12 in. 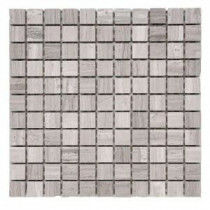 x 6.35 mm Marble Mesh-Mounted Mosaic Tile (10 sq. ft. / case) HGRY LP-01 and leave review or share with Your friends. The neutral tones of Haisa Marble complement traditional and contemporary spaces alike. Coordinating trim pieces and mosaics make it easy to create stunning combinations for floor and wall. Distinctive in color and species, Haisa Marble tile is a natural product, where no two pieces are exactly alike. Veins, lines of separation and occasional imperfections are inherent to the nature of pebble tile and are considered to be desirable in the material. 10 square feet, 10 pieces per case. Case weight is 30 lbs.